John Conley as a World War I "doughboy"
New Windsor, NY (Nov. 1)-- Come face to face with history as you meet "soldiers from the past," authentically uniformed and equipped in a living timeline of American troops from Colonial times forward. On Saturday, November 8, 10:00 AM – 4:00 PM, New Windsor Cantonment State Historic Site in collaboration with The National Purple Heart Hall of Honor invites you to a day full of activities dedicated to the American Veteran. Reminding everyone that Veterans Day is coming on November 11, the historic site and the Hall of Honor salute veterans each year at this time with vivid reminders of what it was like to serve at different times in history. Special programs in galleries include hands-on activities with military equipment in the Cantonment's Visitor Center and the Hall of Honor. Throughout the day troops will be "encamped" around the site and at 2:00 PM the reenactors will assemble to guide visitors through a living timeline of soldiers from American history including demonstrations of the weapons they used. New Windsor Cantonment State Historic Site and the National Purple Heart Hall of Honor are located on Route 300 (374 Temple Hill Road) in the Town of New Windsor, four miles east of Stewart Airport. The site is three miles south from the intersection of I-87 and I-84 in Newburgh, New York. Admission is free. Call 845-561-1765 for more information. New Windsor Cantonment is the living history museum of the Northern Continental Army's final post of the Revolutionary War, 1782-1783, and is home to the National Purple Heart Hall of Honor, preserving and sharing the stories of America's military personnel wounded or killed in battle, recipients of the Purple Heart. Explanation: Spooky shapes seem to haunt this starry expanse, drifting through the night in the royal constellation Cepheus. Of course, the shapes are cosmic dust clouds faintly visible in dimly reflected starlight. Far from your own neighborhood on planet Earth, they lurk at the edge of the Cepheus Flare molecular cloud complex some 1,200 light-years away. 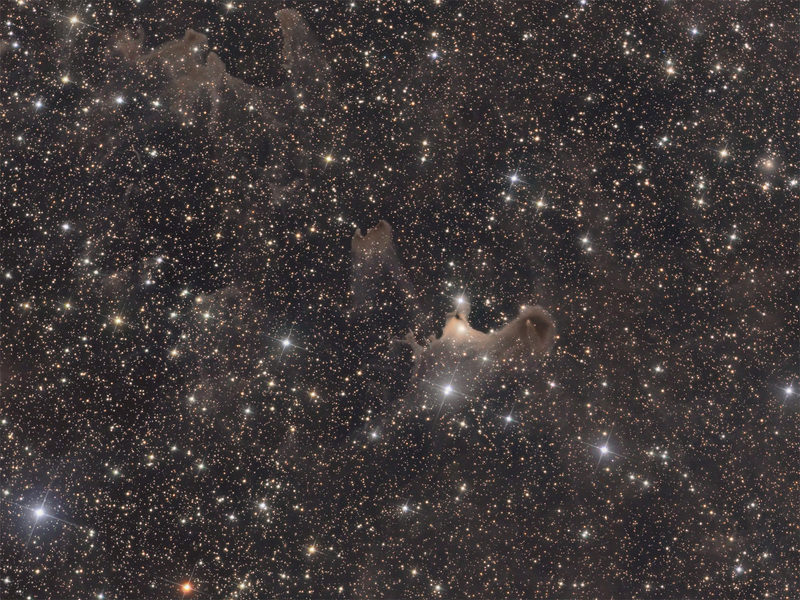 Over 2 light-years across and brighter than the other ghostly apparitions, the nebula known as Sh2-136 near the center of the field is even seen in infrared light. Also cataloged as Bok globule CB230, the core of that cloud is collapsing and is likely a binary star system in the early stages of formation. PIERMONT - The state Department of Health has long issued advisories regarding the consumption of fish from the Hudson River, but surveys have also found that many anglers were unaware of the notices. To help address the problem, the state has launched a 20-year effort - the Hudson River Fish Advisory Outreach Project - to make people aware of the advisories and what they mean, and to encourage people to actually follow the advice. hey'd like some help in reaching out to the community and will hold two public information sessions in the Lower Hudson Valley to forge partnerships. Anglers, immigrant advocates, commercial fishermen, boaters, local health officials, nutritionists, food pantry representatives and others interested in developing outreach plans are invited to attend. 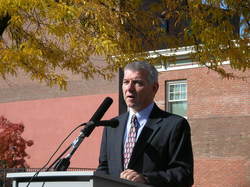 Poughkeepsie, NY (Vocus/PRWEB ) October 30, 2008 -- Vincent Tamagna, president of American Heritage Rivers Alliance, forecasts rapid growth for the Hudson Valley Center for Innovation (HVCFI), a leading business incubator led by Managing Director Les Neumann. Concurrently, Tamagna saluted one of the Center's bright stars, Aerocity, LLC, manufacturer/distributor of a DNA-like helical wind turbine for urban areas. Tamagna commended Aerocity at the recent ceremonies marking the installation of its first pilot wind turbine on a Poughkeepsie building. At the Poughkeepsie ceremonies, Sarah Osgood of the New York State Energy Research Development Authority (NYSERDA), presented to Aerocity a $1 million check -- a grant to fund product improvements. Aerocity President Bill Jacoby noted that "This grant will fund an aggressive program that will establish Aerocity as the clear leader in the field of metropolitan area wind power." This grant will fund an aggressive program that will establish Aerocity as the clear leader in the field of metropolitan area wind power. Aerocity's Jacoby also asserted that, unlike most propeller-driven wind generators, their new "Aerotecture" turbines feature DNA-like helical blades and are vertically shaped, making them ideally suitable for urban buildings and bridges. HVCFI's Neumann noted that Aerocity's vertical turbines are much more bird-friendly and can generate power at very low wind speeds. The power generated can be used in the building on which the turbines are installed; that means the turbine competes only with the retail price of electricity (currently about 20 cents per kilowatt hour in New York City) rather than the wholesale price (about five cents). Tamagna is president of American Heritage Rivers Alliance, a 501c(3) non-profit comprised of 14 U.S. rivers designated by federal Executive Order as "American Heritage Rivers". The Alliance currently is identifying corporations to become permanent benefactors. Tamagna is also the Hudson River Navigator and is based at Marist College. In 1997 Executive Order 13061 designated American Heritage Rivers to be named in perpetuity. In 2007 the rivers became an Alliance (AHRA) with a threefold mission of natural resource and environmental protection; economic revitalization; and historic and cultural preservation. Charged with fulfilling the rivers' missions are executive officers of each river, called Navigators; they are not empowered to act until requested by their local communities. That key restriction ensures AHRA will never be a federal bureaucracy. The Alliance is a permanent member of the White House Council on Environmental Quality (CEQ) composed of directors or assistant secretaries of 16 federal agencies that regularly meet in the White House to cut through federal red tape. The CEQ allows AHRA to provide access to federal multi-agency partnerships and to leverage federal dollars. Currently, AHRA is seeking Charter Benefactors for permanent endowments. Charter Benefactors receive permanent scalable returns on their Corporate Responsibility investments. AHRA President Vincent Tamagna can be reached at 845-265-7000. BUCHANAN - Indian Point is taking its case on cooling towers to court. The nuclear plant's owners are battling the state Department of Environmental Conservation to determine whether they must construct special towers to cool Hudson River water used to produce electricity. The cost to build the concrete towers has been estimated as high as $1.5 billion. Company officials say studies on fish in the river that they've done for more than two decades - under the supervision of the state agency - don't make the environmental case for such a large-scale change. "We don't even know if it's feasible to build these," said Jim Steets, a spokesman for Entergy Nuclear, the company that owns and operates Indian Point. "This is a project that would involve dynamiting next to the plant." Steets said the recent appeal to state Supreme Court disputed the DEC's Aug. 14 ruling that there is no need to argue the question of adverse effect on fish species as environmental regulators look at renewing the nuclear plant's permit to draw billions of gallons of Hudson River water to cool its operation. Specifically, the state is concerned that intake structures for the cooling water destroy too many fish eggs and larvae as they are sucked in and hurt larger fish that are pulled against the screens or exterior of the intake system. The state says those actions destabilize the habitat, but Entergy's experts say most of the eggs and larvae would not survive regardless of whether they were caught in those flows because the odds of a single one surviving to maturity are so slim. "The (DEC ruling) says adverse impact on the fish can't be argued because it's a given," Steets said. "We don't believe that. Anything you do on the river is going to have impact, but we've spent 50 million dollars to assess those impacts for nearly 30 years and done everything we've been asked." Yancey Roy, a DEC spokesman, declined to comment on the matter. What may prove a bigger issue for the courts and the parties to decide is how much environmental impact building the towers would have. Anti-nuclear activists in the early years of Indian Point argued successfully against the cooling towers, and by the time the large cement towers are presented to the public this time around, they likely will be evaluated on issues such as whether building them would too severely limit Indian Point's ability to produce necessary electricity as well as require the relocation of a natural gas line on site. Environmentalists and the state want the closed cooling towers to recycle water and lessen the need for the river to be part of the plant's operation. Additionally, putting water that has been warmed by use back into the Hudson results in what is called thermal pollution. According to the state's permit requirements, the system that is required "shall reflect the best technology available for minimizing adverse environmental impact." The DEC recently issued a permit to Entergy's FitzPatrick station, a nuclear plant on the southeastern Lake Ontario shore where no closed-cycle cooling has been required, company officials said. Some of this will have to wait until at least March, when the U.S. Supreme Court is expected to take up a case examining whether the Clean Water Act can effectively force a change to the best technology available without regard to environmental effects. Until then, the 1987 release permit the DEC granted Indian Point remains in effect. Reach Greg Clary at gclary@lohud.com or 914-696-8566. Two weeks ago, I told you that the fishing was good. It still is! If you like the excitement a big smallmouth bass gives you when hooked, now’s the time to get out on the water. I know it’s cold in the morning, but not so cold it can’t be dressed for. And with all the rod-bending action you’ll most likely have, the adrenaline rush will keep you warm until the sun heats things up. Right now, two of the hottest smallmouth bass spots are rivers: the Mohawk and the upper Hudson. This is where to be now if you’re looking for big smallmouth bass, and plenty of them. The bite is from Lock 7 to Can ajoharie and Lock 14. That’s a long stretch of water, but the fishing reports all through that area have been very good. In the Alplaus pool, the bridge abutments and all around the channel sides of the islands are holding schools of smallies. In the Rotterdam stretch, the riprap and the eastern and western ends of the island by Lock 8 are good. All throughout the day, smallies have been chasing baitfish. When you see the eruption on the surface, get a lure into the middle of it as quickly as you can. If you put in at the Kiwanis Boat Launch, don’t be in a hurry to leave the area immediately. Drop an electric trolling motor and fish the shorelines on both sides of the ramp for about 100 to 200 yards. There’s some very good under water structure there. The section between Locks 9 and 10 has always been good for smallmouths, and now it’s even better. The railroad bridge, Swart Island (channel side) and around buoy marker R194 are good areas to key in on. My favorite spots this time of year between Locks 10 and 11 are the islands, and I fish all around each one of them. The one between buoys G209 and G211 is close to the channel edge and can hold some big smallie surprises in the fall. The next two pools between Locks 11 and 12, and 12 and 13 are primarily channel edge and riprap fishing areas. But here, just like anywhere on the Mohawk this time of the year, you have to watch for smallies chasing schools of baitfish. And that can be shallow or in the middle of the deep channel. Fish the islands and creek mouths up to Canajoharie and Lock 14 at the Palatine Bridge. The best lure choices for the Moh awk River appear to be stickbaits like the Rattling Rouge and Rapala, the soft jerkbaits such as the Fin S Fish, and any of the new swimbaits. Make a long cast, let it sit a few seconds, then use a three to four jerk-and-stop retrieves. For the hard baits, try fire tiger and shad colors, and white or pearl with black for the soft lures. And, as always, don’t give up on wacky worms. They always seem to work when nothing else does. If you launch at Admiral’s Marine on the western shore in Stillwater, you don’t have to venture very far to find good smallmouth water. The fun begins straight across from the launch site at buoys G77 and G79. Work all around this point both shallow and deep. Heading north, there are more than 14 miles of water before you get to Lock 5 that give smallmouths plenty of places to hide. A mile upriver, there’s a large weed bed with a deep edge along the eastern shore. Here, the smallies roam in and out of the weeds feeding throughout the day. Fish it slowly and thoroughly before moving. North about three-quarters of a mile on the western shore at buoy G91A, there’s a small inlet. Fish both in and outside of this area. water in the creeks is moving. This is where the baitfish are, and the bass will follow. 10-feet-deep water in front of the inlet. Toss baits into the shallows, and work them back to the boat. This is one of the areas where I often see surface activity throughout the day in fall. Buoys G135, G137 and G139 mark a good-sized, unnamed island with a fairly deep channel side, and it’s a favorite feeding hideout for river smallies. Catch the right school feeding, and you can hit it big in terms of numbers and size. Nov. 1 last year, I caught a five-pound, seven-ounce smallmouth, my biggest ever on the river, just off the northern tip of this island. It’s probably over six pounds by now. My last stop begins just north of the Route 29 bridge on the western shoreline. You can see the rocks and ledges that step down from just a few feet deep right on out into the channel. Drag a bait slowly through these areas, and you’ll catch smallmouths. Also, before leaving, try the east side shoreline outside the wall leading into the lock. There is some underwater rock structure that attract fish all year long. You can work this in a little ways, but be careful. It gets very shallow quickly. Lure choices for this stretch of the Hudson River are quarter-ounce jigheads with rootbeer-colored spider grubs, green-pumpkin colored tubes, No. 177 Senkos, and every once in awhile, I make 10-20 casts with a Pop-R which can bring them up from the bottom with an attitude. 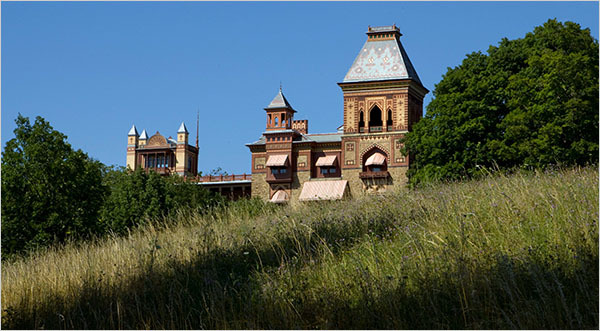 The Olana Viewshed Tour on Nov. 1 offers a rare chance to explore 12 private Hudson River Valley properties, as well as Olana, Frederic Edwin Church’s 19th-century house and 250-acre landscape in Hudson, N.Y. Church, a Hudson River School painter who worked with Calvert Vaux and Frederick Law Olmsted on creating Central Park, sited his home high over the Hudson River, with an eye to the views. Guests driving carriages up the hill would have alternating views of open meadow and forest, catching glimpses of vistas across the river: an old farm, an apple orchard, cattle in a pasture. The tour, which offers visitors a similar experience, is the brainchild of Mark Prezorski, a local landscape designer who preserved 150 acres of his own land in cooperation with Scenic Hudson, a nonprofit group that has protected 1,248 acres. “I had this idea that if people could be in a viewshed, they would start to understand it,” he said. “Even small gardens have views, and we’re hoping to get people to pay attention to that.” And to the fact that as land is developed, viewsheds disappear, he noted. Information: (518) 828-1872, extension 103, or olana.org. There will be a guided hike with Eric Nelsen on Sunday, November 2, meeting at 4:30 PM at the Kearney House at the Alpine Boat Basin & Picnic Area (Palisades Interstate Parkway Exit 2). The hike, which will cover about 3 miles round-trip distance in about 2 hours over moderate trails, will be held "drizzle or shine" and is free and open to all. No advance registration is required. "Short Stories for Long Nights"